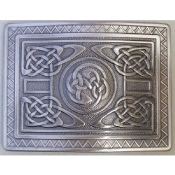 Highland Swirl motif with antique finish kilt belt buckle. Fits standard 2 1/4 inch kilt belt. Made by Glen Esk.